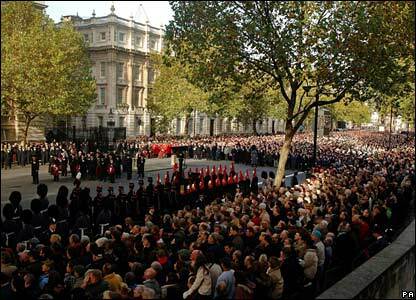 Thousands of spectators and 8,000 ex-servicemen and women merged in Whitehall, London, to pay their respects to those who died in battle. As Big Ben chimed 11, veterans fell quiet in memory of those that paid the ultimate sacrifice fighting for their country. 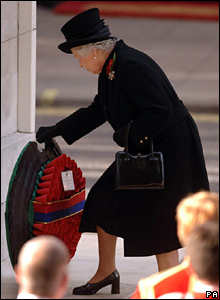 The Queen led the nation in two minutes' silence in honour of Britain's war dead before laying the first poppy wreath at the foot of the Cenotaph. It was the first Remembrance Day since members of Shot at Dawn, families of WWI soldiers who were executed for desertion, received pardons from the government. 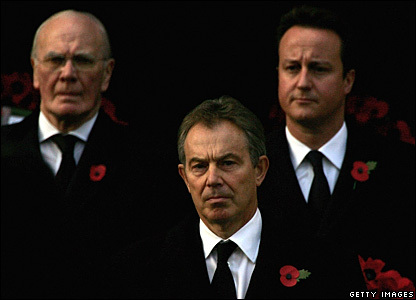 The service of remembrance was attended by Prime Minister Tony Blair, Liberal Democrat leader Sir Menzies Campbell and Conservative leader David Cameron. They all laid wreaths. 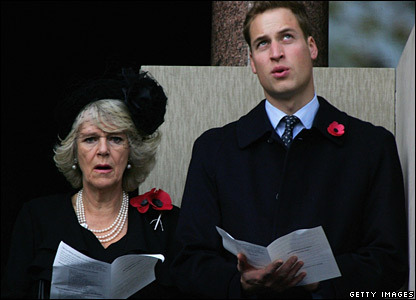 Prince William and his stepmother Camilla, the Duchess of Cornwall, sang from a balcony at the Foreign Office during the service. Old soldiers prepared to march past the Cenotaph. 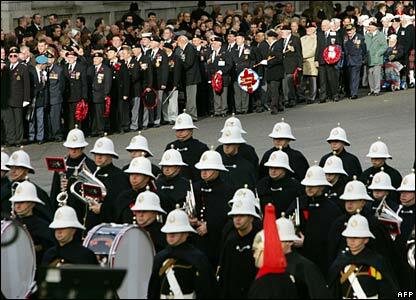 More than one million men and women from Britain and the Commonwealth died in WWI and nearly 500,000 in WWII. 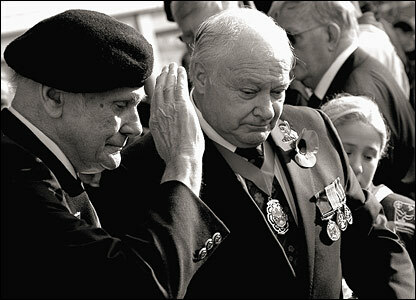 Elsewhere in the UK, war veterans reflected on lives lost. In Harold Hill, Essex, an elderly soldier saluted fallen comrades after laying a wreath at the foot of the local memorial. 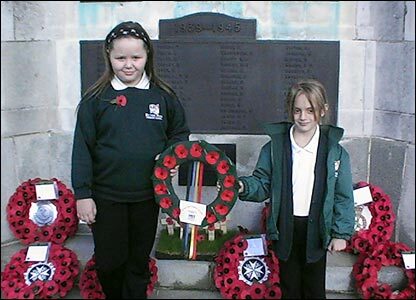 And in Worksop, Nottingham, two schoolgirls from Ryton Park School paid their respects with a poppy wreath. 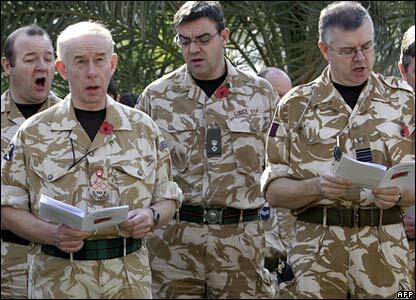 While overseas, British soldiers sang a hymn during a service at the British embassy compound in the fortified Green Zone in Baghdad. 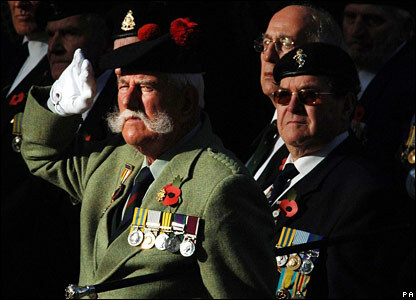 When's it right to wear a poppy? 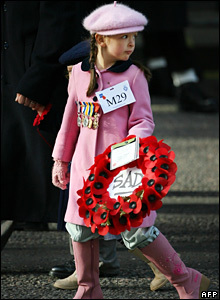 How did you mark Remembrance?